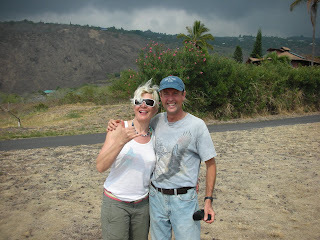 It's been a while since I have written a story......ok, I have never written one, but finally I got down to work and this Big Island Soaring Blog needs some new ink. I was trying to get Thom 'Sidehill' to come to the Big Island Playground again. It had been awhile since he been with the gang here. 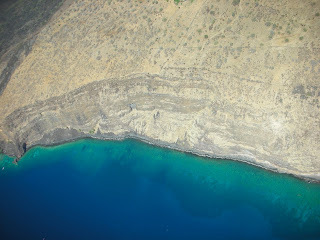 It was tough until, I had a 4k flight one day with a trip north to land at Kona Waina Elementary School and then Scotty & Bill made it to Old A's ( old air port just past Kailua Kona proper). These XC trips were all it took and the fact that the strong winds shut down Oahu for the next week or so. He booked his flight to Kona totally forgetting that he had the HPA annual meeting to attend. I told him what is the worst that can happen, they will vote you out, only Alex has a life sentence. I picked him up at the airport on Friday at 9 a.m. and we headed to Church. We stopped by Azfelia's (probably miss spelled) which is a new LZ for him since the old Brown Spot now has houses on it. We walked it and I gave him a thorough briefing. We were headed to the Church when the Gene, Sammy and Scotty past us. Hey, wait for us. Their car was full and Jean said he would come to pick us up at the bottom of the launch hill, so we headed up and parked at the bottom. Thom got his gear ready as did I. Gene was there in moments and appeared to be happy to see Thom, as you know Gene is a PG politician too. We were greeted at the Club House by Smiling Sammy & Scotty Gee. Small crew today just the five of us. Scotty, Gene, Sammy, Thom & me. Great flights were had by all but Thom scored only one, he stayed up for just under 2 hours and broke his Big Island record. Highest and longest time for a flight. We, 4 landed and road back up and prepared to re-launched while Thom was still up. But by the time were launching he had was tired and had gotten low. He headed in to land at the new LZ. Gene had headed home, so we were down to just 3. Thom said you guys stay up and have a good 2nd flight. I am going to take a nap or walk down to the Ice Cream store. Apparently he talked himself into the ice cream and started walking, it's a long walk down from there especially with a stuff sack hitting you in the back of the legs. While he was eating his ice cream he met Doug Stroup's dad. Doug is an instructor in Washington state that runs alot of the Chelan Opens. Then he got the call that we 3 had landed at Azfelia's but we needed a car. We asked him to keep walking to the Church and grab Sammy's car. I know that is not very hospitable to have a visiting pilot walk all the way down to get the car to come pick us up but it gets worse. Thom arrived and we told him he had to stay on the side of the road while we drive Scotty to his truck, me to mine and then let Sammy go on his way. So, now we stranded him along the side of the road watching our gear. I guess I owed him one now. But he got that the next day. Saturday was another day and it looked a tad but better than Friday but you never know. The crew was bigger this day with Neil, Charlie, Denise, Visitor Stan, Meila (not spelled right I am sure but she might understand) and most of Friday's crew of Sammy, Scotty, Thom and me. 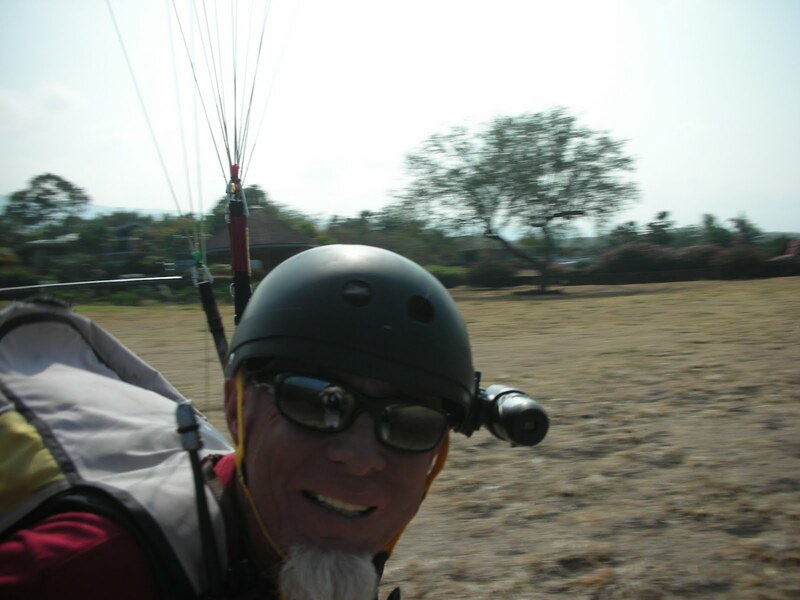 Everyone had great flights and as usual Neil ventured off north giving us updates on the conditions and his elevation. Thom got the closest to Neil's 3600' by hitting yet a new personal record of 3200'. Thom got to fly over the Pali, towards Choice Mart but turned out over the bay to land shortly after with Sammy at the Church. I had the scratch session that was the hardest I have worked in quite sometime. I flew for an hour and 20 minutes trying to get above the road and when I did I was beat. When I finally had enough elevation, I took a 10 minute jaunt to join Sammy and Thom at the Church with Neil coming in shortly after. We were tired and hungry, so Thom & I left to Annie's for some lunch. So far Thom is 2 for 2 but he has an XC itch that he wants to get a trip to the Old A's. Hopefully Sunday just may be brewing in his favor. It was my 1st day on the Island, and my 1st mistake of the day was seeing the huge vertical development taking place and thinking how good the lift was going to be, instead of thinking how dangerous the clouds were going to be. 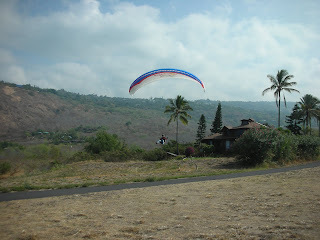 Having only flown Kahana once, and not getting up on that occasion, I headed up the hill expecting to just get the lay of the land and try and identify the best areas of lift. Woody was already up and playing out front as Alex, Duck and I began our ascent of the hill. Being totally out of shape and with a bum toe to boot, Duck and Alex had already launched by the time I made mid launch. With just a slightly sketchy launch, I got airborne and began to work my way up to the main ridge. The air felt pretty thermic so I was right at home and soon worked my way up to about 1500 ft. before heading back to Pu’u Pei’i? I then joined Alex back out front to climb some more under the wispies, then followed him around for a while. At one point I stopped to climb in a thermal on Pu’u Pei’i? and took a couple of collapses just before going into a cloud that had suddenly formed in front of me. Alex radioed he was in the cloud, so I responded I was in it too at 2400 ft. and headed 60 degrees. I was only in the whiteroom about 2 minutes before popping out the top. Duck and Alex were headed towards Sacred Falls with Duck reporting strong thermals, so I headed across the valley hoping for my 1st Oahu XC. I headed towards Alex as he was obviously climbing over the ridge. There was some really good lift there, but now Alex and Duck were heading back toward the ocean and there was a huge cloud developing in front of us. Duck was already under it and Alex was headed back toward launch. When I saw Duck pull ears, I immediately went to ears and speedbar, but was still going up at 2-400 ft. min. About a minute into the cloud, it looked like I was breaking through, so I let my ears out thinking I could just fly out the front. That was my second mistake. This is when the flight really started going bad. I began to doubt if my course toward the ocean would get me clear of the clouds, so I radioed for directions to get clear. I was told to head North, but this didn’t compute because at my home site North is to my right when facing the ocean. At about 3300 ft. I started to come out the top, then pulled ears and found some holes in the bottom. The terrain was looking awfully close at this point, so I let my ears back out and suddenly hit extreme turbulence and a rush of 1600 ft. min. up. At this point, things started getting progressively rougher and wetter, and holding a steady course became nearly impossible. At one point, I thought I was seeing small hail, but I think it was only water droplets streaming off my risers. When I finally saw holes below me, I was still about 3400ft. I pulled big ears and was soon sinking at 6-800 ft. min. I finally broke out under the clouds at 2500 ft. and could see ocean in the distance. What I didn’t realize at that point, was that I was on the opposite side of the Koalaus. But what I did know was there were miles and miles of jungle between me and civilization. I thought about trying to get back under the biggest cloud which was to my right, but didn’t have enough height since it was over a ridge. My next move was to follow a big valley toward a sunlit area hoping to find some lift there. Not sure I could get there, I tried a ridge to my left, but inadvertently flew into it’s lee and the corresponding turbulence. When it was clear that I wasn’t getting out of the mountains, I began searching in earnest for a fairly level spot with the lowest or sparcest trees. Spotting one, I made a beeline for it, but didn’t have enough altitude to get downwind and had to come in pretty hot. I was having to be so active just to keep the wing open in the incredible turbulence that there wasn’t a lot of control left for course changes, so I was fortunate that a fairly bushy tree slowed me down before I hit the solid one. Landing on my head, once again I was glad to have a good helmet on. After it became clear from the lack of wings in the air above, and silence on my radio, that I had no radio contact, I began searching through the thick underbrush for the cellphone that had fallen out of my flight deck when it opened on impact. I was quite relieved to see that one little bar on the display, and immediately put in calls to Thom and Don, the only 2 local numbers I had. Then I took stock of my resources. Let’s see; ate my last granola bar before climbing the hill. One swallow of water left in the bottle. Wing is nicely laid out between a snag and a small tree. I extricated the wing from the tree packed up, and began searching for a way out of my predicament. Every way I tried to descend to the creek below was blocked by vertical drop offs, and every step was a struggle as it was total deadfall covered in uluhe fern. I was getting dryer by the minute, and after some conferring with folks on the phone (the battery of which was rapidly declining) realized that I’d better just do the smart thing and call in air support while I was in a good pickup location and there was still daylight and clear sky above. In contact with the good folks at Fire and rescue, I guided the chopper to my location, they lowered a guy on a rope, he graciously shouldered my pack, hooked me into my big blue diaper, and away we went, swinging under the chopper and over the jungle to a park in Whittmore Village. Pretty cool ride actually. Then I had to hike about a mile to the right bus stop, talk the driver into taking my pack, transfer to another bus, talk that driver into taking my pack, and arrived tired but unbroken back at camp in time for dinner. The highlight of the trip was the scenic tour of the North Shore and a cute, but very wasted little filly named Trish who kept me entertained on the bus. Aloha to Fire rescue and all the HPA guys who helped out, Woody and Thom for accommodations and Frank for hiking Cactus with me on Sunday for a nice relaxing Makapu flight. LZ coordinates: N 21 33 874, W 157 56 882. Elev. 1743 ft.
We will be spraying gorse at Puuloa. Always a pleasure to have visiting pilots with awesome skills! While I missed the comp pilots top landing at will on Friday, it sure was a pleasure to fly with Phillip and Monica on Saturday and Sunday. Hope to see you all in the air again soon! In the words of Phillip "keep on flying!" Wednesday 10/05 was another awesome day at K-bay. The 1st flight started at about 9:30 and everyone that launched got up. That would include Sam, Dennis, Charlie and Me; with Gene following over an hour and a half later. 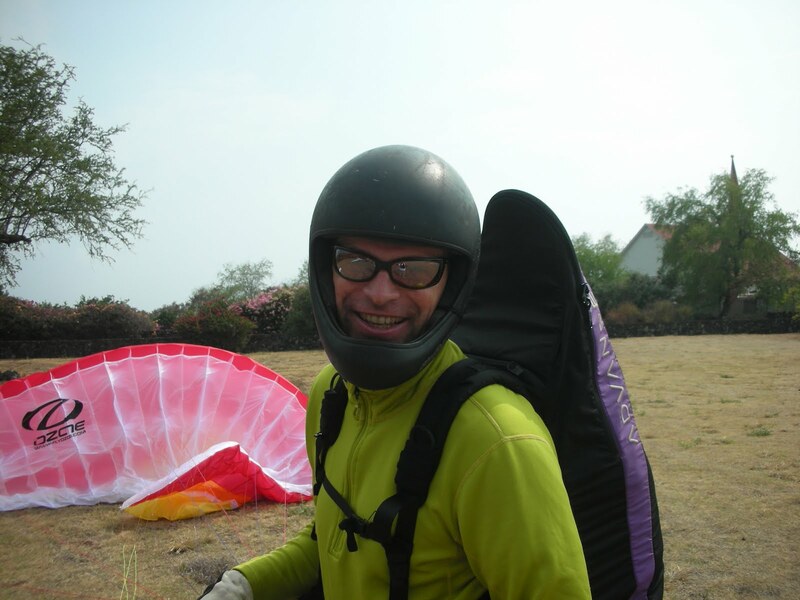 Greg, who gave us our 1st ride up to launch, unfortunately made the decission to skip flying today. The lift was moderate, but widespread. The Lava was pulsing; it was working over McCoy's, Kalamalani, the Bananas, behind the Brown, at the Church, and even over the bay side of the Pali. Almost every cloud I flew to took me up. Base was a little low, but I was smelling roasting coffee at 2800 ft. at one point, without being in the clouds. There was even a little rubbish fire at McCoy's to follow the smoke up from. 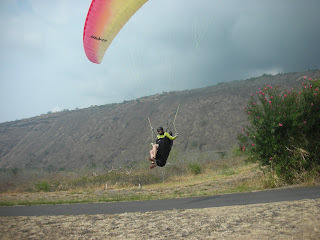 Everyone had at least one good flight, and some 2, before it finally clouded over and started to sprinkle on the hill. Let's hope this is an indication of good things to come for the rest of the fall and winter. Well, here's the story I promised last month. After a lot of good ground work and scouting by Ted, (not to mention the sales pitch to Sam and me) Sam and I took a look at the launch above Whittington Beach park and it looked doable with survivable consequences for failure .It was about 5 pm, with a cloud layer from the hills in back, out over the water, and a fairly steady breeze blowing in at 8-10 mph on launch. No white-caps on the water. I took the first shot at it, and after some difficulty getting the Delta up cleanly, I got off on the very shallow slope. There was some turbulence early, but enough small pockets of lift to give me a little cushion above terra firma. Then I ran into the compression zone and seeing 0's to neg. numbers, got on the bar and pushed it back up to 8 or 9 mph. I was only using about 1/2 bar so had plenty left if it had gotten worse. That was enough to get me over the edge of the hill and into mellower air. Now I had the LZ in easy reach with over 800 ft. of altitude. And what an LZ it is. Huge, flat, open, with mostly short grass. Wish we could move it over to K-bay! After landing, Sam took off and had a rather uneventful flight as well (ignoring my advice on the radio, not to launch). Ted handled the retrieve and we all celebrated another Big Island site pioneered. I believe that there is certainly some caution needed in deciding when to fly this site, but there may also be some big rewards in the area of XC's and great views for someone getting the timing right.